Fincham, Robin, Rhodes, Peter S.
This is the first book to offer students a comprehensive foundation in behavioral studies. It develops psychological and sociological perspectives in a distinctive but complementary way, ranging across several different levels of analysis-individual, group, occupational and organizational. Focusing on relevant areas within the work context, the authors adopt a critical discipline-based approach, providing students with an up-to-date account of theoretical developments and empirical research from the main areas of occupational psychology, industrial sociology and organization theory. Topics such as work-related stress and alternative job design are thoroughly explored, as are current debates on the labor process and new technology. 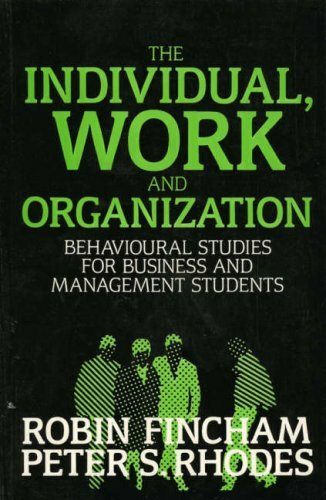 This book is a valuable introductory text for all business and management students, as well as being highly relevant to more advanced levels of study, particularly those in human resource management and industrial relations. Robin Fincham is Lecturer in Business Studies at the University of Stirling.